A Spanish-speaking family who had lost everything in the Napa fires of 2017 moved to Denair early last year. In the course of registering her daughter at Denair Middle School, the mother shared with bilingual secretary Elvia Brizuela that they had very little. Their clothes, their bedding, their life’s possessions – all had been lost. The mother – whose husband is a farm worker — was worried about her children and the effect having to wear the same clothes over and over was having on them. Brizuela quietly went to work, asking members of the campus community to donate items. Many were happy to help. Others donated anonymously or provided money. The family was provided for and their crisis eased. Not long after that, Brizuela encountered a single mother in a similar situation. She had one child in middle school and another in high school. She asked Brizuela if she knew anywhere that sold discounted furniture. Her children also needed clothes. Again, Brizuela discreetly put the word out. And again, her co-workers responded. One anonymous donor even took the family shopping at Walmart. “She was amazed,” Brizuela said of the mother. “Today, she’s back on her feet and she paid it forward” by helping out others in need. 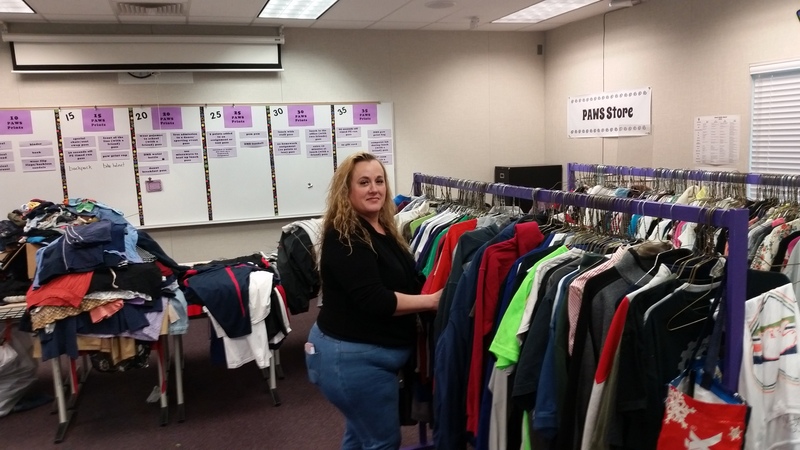 From such generous and humble beginnings was born the Coyote Closet, an effort by the Denair Unified staff and the Legacy Health Endowment in conjunction with Sierra Vista Family Services, which oversees mental health programs for the district. 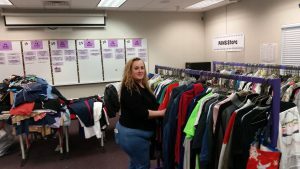 A vacant classroom on the middle school campus has been turned into a community closet. There, families in need can shop for free in a private, secure environment. Sierra Vista delivered some clothing items at the beginning of this school year. Denair staff members and their family and friends have graciously contributed many others – clothes, jackets and shoes for boys and girls of all ages, bedding and blankets, even purses and clothing items for adults. One Denair resident made some of the clothing racks; others were donated by K-Mart along with hangers. So far, Brizuela said six or seven families have been helped, but there is a strong desire to do even more. Organizers want to get the word out that such a resource exists. “We know there are a lot of people who can use help, but they’re too shy to ask,” she said. Much of the clothing is “gently used,” but there are some items that were purchased brand new and donated. Brizuela knows because the sales tags are still attached. Privacy, discretion and respect are critical to the Coyote Closet. Referrals can come from teachers or others on campus, Brizuela said, in addition to what she and other staff members at each school site learn when parents register new students. At Christmas time, there also was a joint effort with the Kiwanis Club of Greater Turlock to identify families in need. Parents, too, can benefit. Brizuela shared the story of a mother who was injured in an auto accident, causing her to lose her job. She didn’t have nice clothes to wear to an event, but found just the right outfit in the Coyote Closet. Brizuela already envisions a campaign this spring to get prom dresses donated for high school girls, especially some who attend Denair Charter Academy. Families who would like to take advantage of the Coyote Closet or to donate items to it should call Brizuela at (209) 632-2510, ext. 3211, to set up a shopping appointment or to drop off clothes. Most visits happen after school is out, ensuring privacy. “It’s really meant to be a resource for our entire community,” said Denair Middle School Principal Amanda Silva.